PITTSBURGH — Scott Mayfield wanted to practice with his Islanders teammates on Monday at PPG Paints Arena. Coach Barry Trotz told him to take the day off. But Trotz said there was no concern over the defenseman’s availability for Tuesday night’s Game 4 of the first-round series against the Penguins, with the Islanders looking to complete their first sweep of a best-of-seven series since 1983. Mayfield logged 17:12 in Sunday’s 4-1 win in Game 3 at Pittsburgh with three blocked shots, giving him eight in the series. Lefthanded shooting Thomas Hickey likely would enter the Islanders’ lineup in Game 4 if the righthanded shooting Mayfield is unavailable, with lefthanded Devon Toews shifting to his off-side. 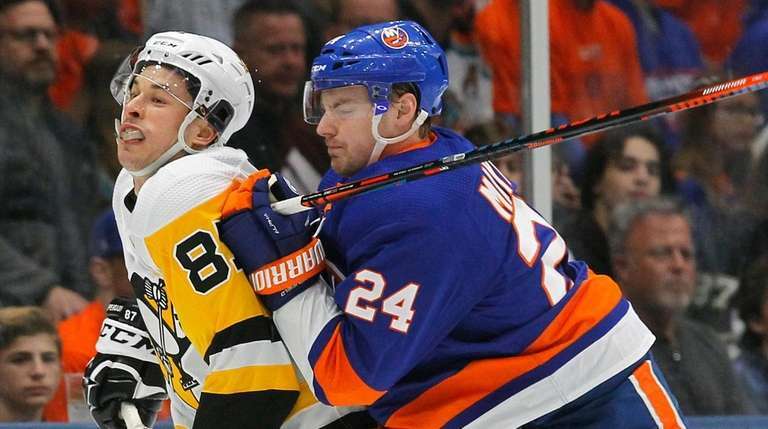 The Islanders are now one of the betting favorites to win the Stanley Cup, at least in new odds released by BetOnline, one of the more heavily-trafficked online gambling companies. The Islanders were given 7-1 odds to win the Cup, trailing only the defending Cup champion Capitals, who are 5-1, among the NHL’s 16 playoff teams. The Flames, Blues and Golden Knights all were listed at 8-1, the Penguins were 40-1, while the Hurricanes were last at 50-1. The Penguins opted not to practice on Monday, and coach Mike Sullivan told the media at the team’s facility in Cranberry Township, Pennsylvania, his team has responded to these days off.